Thank you for placing your name on our Be The First To Know List! Should any cancellations occur for The Retreatment Mexico, we will reach out to you right away. Natalie grew up in a household that was steeped in spirituality and healing, with a Jungian analyst, a former nun, and a doctor among her immediate family. Her studies in psychology began in performance through years of multi-disciplinary training including: Suzuki, Viewpoints, Grotowski and Committed Impulse. Natalie took her performance career into movement, touring the world as a dancer for David Byrne and the Yeah Yeah Yeahs before seeking a more immediate connection with community. In 2013, she met Taryn Toomey and became the first employee of The Class and is a Founding Teacher, along with Jaycee Gossett. Through her work in The Class, she has been able to strengthen her own ability to move through trauma and, in turn, help others heal. Natalie's classes are athletic, vigorous, empowering, and suffused with her natural effervescence. She brings her students face-to-face with their own personal challenges; together, they sweat, they dig deep, and they come out energized — discovering how strong they are, mentally and physically. 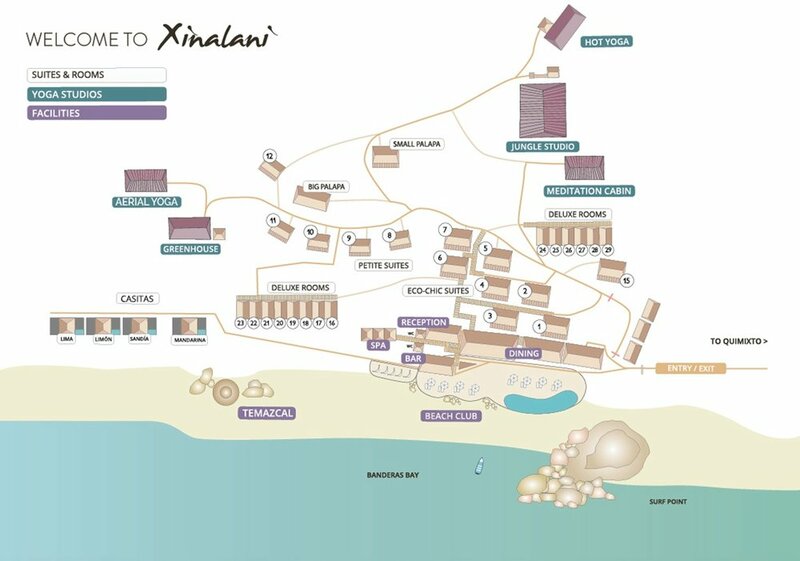 Xinalani offers an unparalleled retreat experience: authentic and magical, immersed in lush jungle surroundings with views of the emerald ocean. 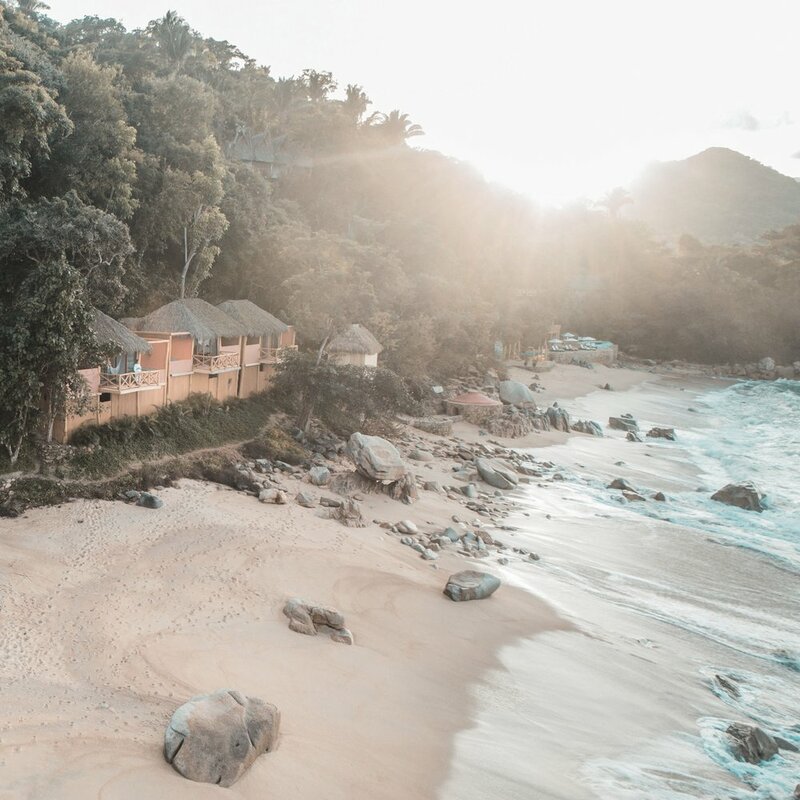 With direct flights from LA and NY to Puerto Vallarta, the adventure begins with a short boat ride from the main land to our retreat sanctuary. With a concentration on sustainability, everything from the accommodations to the practice space have been carefully integrated into the natural landscape. The property is nestled into a hill with stairs connecting the sea line to the jungle studio high above. This retreat is not handicap accessible. Sleep immersed in the jungle in beautiful open-air, eco-chic accommodations. Enjoy delicious and healthy Mexican food oceanside, and practice The Class and restorative movement in the afternoon in a stunning practice space perched high amongst the trees. Join us in paradise and nurture your wellbeing. Wake up to a cup of coffee and a light breakfast to the sound of the ocean waves and view of the Bahia de Banderas Bay. 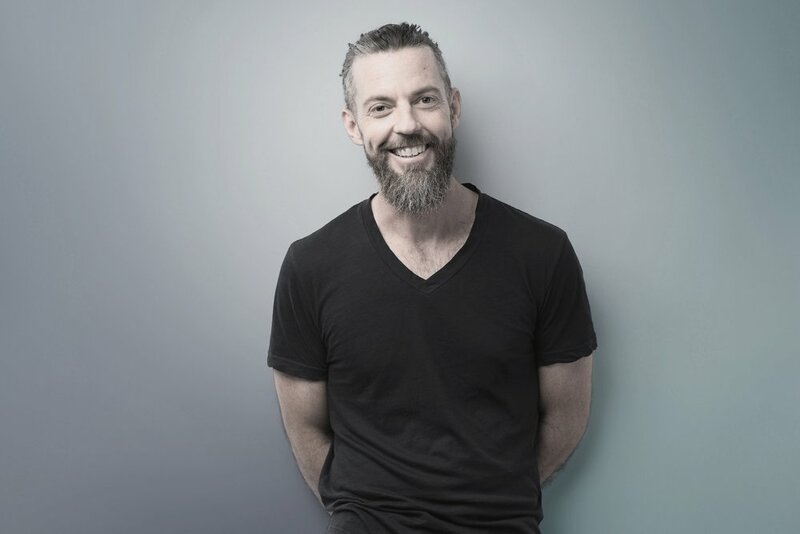 Morning meditation with Kevin will be followed by 2 hours of The Class with Natalie. Xinalani’s Chef will be creating simple, healthy, and authentic family-style brunches, focusing on farm fresh, local ingredients. 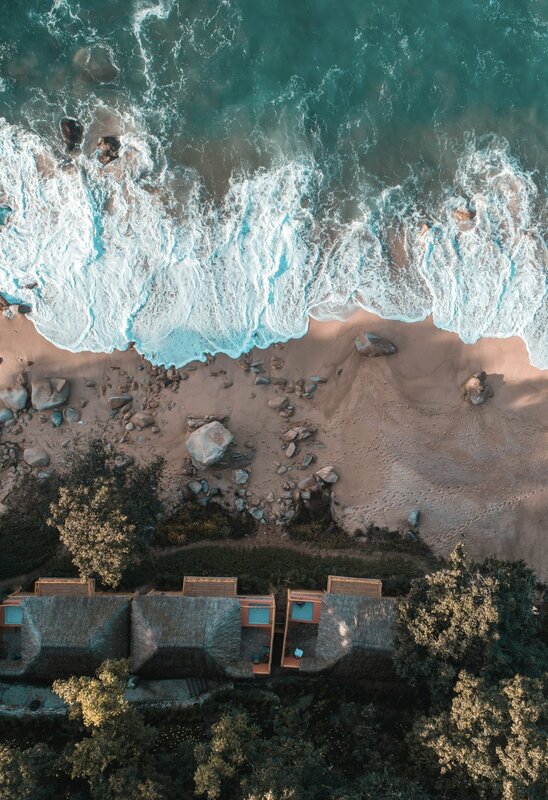 Choose your own adventure each afternoon by taking a dip in the plunge pool with ocean views, swimming out to the floating hammock, trekking to a hidden waterfall, or paddle boarding to one of the many private beaches along the coastline. In the late afternoon, join Kevin for a cooling restorative movement class surrounded by nature. Our dinners will be clean, fresh dishes that highlight the best in seasonal, locally raised and harvested produce. Set at the edge of the ocean and bordered by lush jungle, Xinalani’s beachfront restaurant offers a gorgeous menu and a unique outdoor dining experience. The menu is designed in collaboration with Xinalani’s executive chef and The Class team to ensure that all offerings are gluten, dairy, and refined sugar free. Our healthy gourmet meals are inspired by delicious traditional Mexican recipes. Sit back, relax, and nourish yourself from the inside out. If you have any dietary restrictions, just let us know when you book and we can absolutely accommodate. All of the casitas and rooms are spacious, palm-thatched roofed cabins built on stilts. They were designed with, built and furnished by local artisans. All rooms includes hot water and a breathtaking view of the ocean. The Casitas are ocean-side with spectacular views. 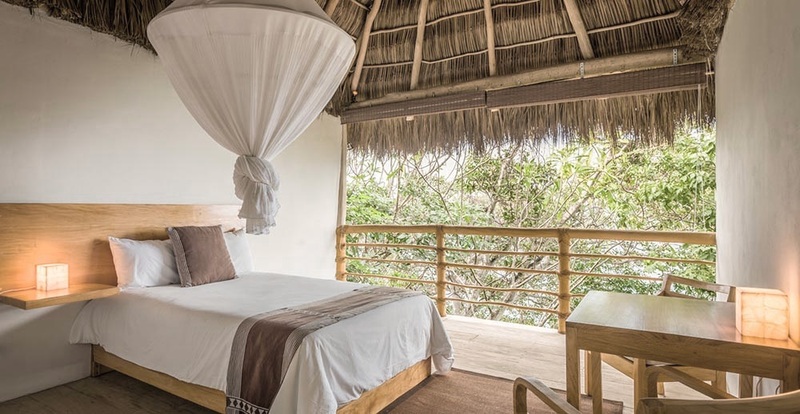 All Casitas are 538 sq ft and have a private terrace, a hammock, a sitting area, a private bathroom with an open-air shower, and a large closet. All beds have pillow top mattresses, and gorgeous mosquito netting. With the best locations on the property, these open-air suites have the most spectacular ocean views and unique zen-chic settings. Each has either one king size bed or two full beds with pillow top mattresses, luxury linen, and beautiful mosquito netting. All Eco-Chic Suites have a private terrace, hammock, sitting area, private bathroom, and closet. While there is no AC, the thatched roofs allow for the ocean breezes. Petite Suites are small casitas equipped with one king size bed or two double beds with pillow top mattresses, luxury linen, and beautiful mosquito netting. They feature a private terrace with ocean and jungle views, hammock, closet, zen sitting area and a private bathroom with an open-air shower. While there is no AC, the thatched roofs allow for the ocean breezes. Deluxe rooms are cozy and perfect for single travelers, two friends, or family. They feature either two twin beds or one full bed, a spacious bathroom, open-air shower and sitting desk. While there is no AC, the thatched roofs allow for the ocean breezes. 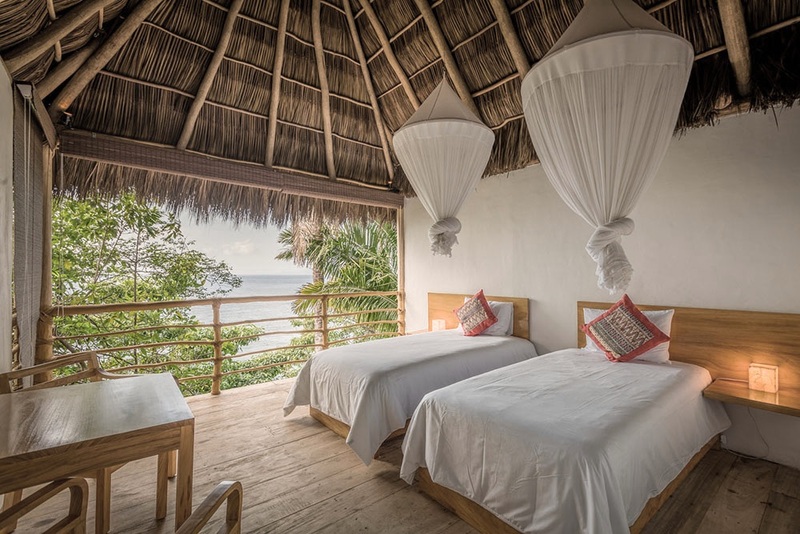 The Small Palapa is a large room equipped with 4 twin beds, making it the best choice for a group of friends. Each bed has a mosquito net and nightstand. Located high on the mountain, this room is the closest to our practice space, the Jungle Studio. It has a large terrace, hammock, and a luxurious bathroom with an open-air shower. Sit back and relax in its lounge and enjoy its beautiful jungle and sea views. While there is no AC, the thatched roofs allow for the ocean breezes.